Sachin Tendulkar’s photo with daughter Sara will make you go awww! Indian cricket legend Sachin Tendulkar on Friday took to Twitter and shared photos from the graduation ceremony of her daughter Sara Tendulkar. Both Sachin and Anjali Tendulkar joined Sara at her graduation ceremony in London. Sara who graduated from the University College shared her photo on her Instagram and wrote, "I did what?" "May you go out and conquer the world Sara," Sachin Tendulkar said. 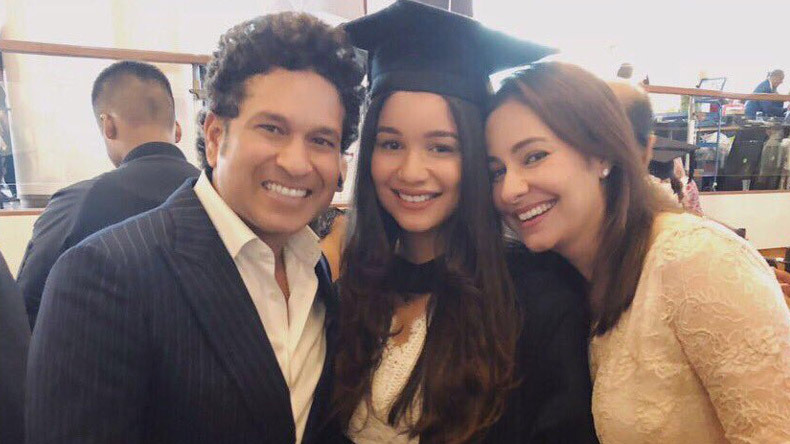 Congratulating her daughter Sara on completion of her graduation, Indian cricket legend Sachin Tendulkar on Friday took to Twitter and posted photos with her daughter Sara and wife Anjali Tendulkar from the graduation ceremony. Master blaster Sachin Tendulkar and wife Anjali both joined Sara in her graduation ceremony which took place in London. Taking it to Twitter, Sachin posted an emotional message for her daughter saying that it feels like yesterday when she has left home for UCL and now she has become a graduate. Anjali and me are so proud of her! May you go out and conquer the world Sara. Celebrating the occasion, even Sara Tendulkar took to her Instagram and posted an image of her. Sara who has graduated from the University College shared her photo on her Instagram and wrote, “I did what?” Sara Tendulkar was studying a medical course in the London college. Before going to London for higher studies, Sara Tendulkar attended school at Mumbai’s Dirubhai Ambani International School. Sachin Tendulkar is an avid user of social media who keeps sharing moments from his life. In the recently shared photos, Sahin can be seen with daughter Sara and wife Anjali from her daughter graduation ceremony. The trio looks adorable in all the photos, creating special memories of life. Previously, Sara Tendulkar was spotted at Mukesh Ambani’s son Akash Ambani and Shloka Mehta’s engagement ceremony which was held in Mumbai. The occasion was graced by B-town celebs, industrialists and politicians. Sara Tendulkar is also an avid user of social media who keeps posting updates and moments from her life on her Instagram page. She keeps sharing her latest photos and videos on Instagram where she has over 200,000 followers.